Cost: £1 for a small packet. 3 ugly, little plastic creature-things. 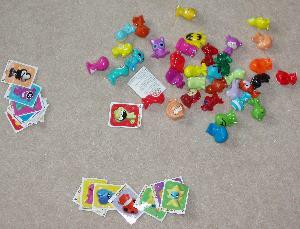 3 stickers of different little plastic creature-things (also ugly). A sticker album can be bought separately for under £5. Be aware, though, that there are different generations of Gogo's, so make sure you get the right one. Traditional - Throw 5 in the air and score points according to which way up they all land. On Line - Throw Gogo's at a line and see who gets closest. Bowling - Throw Gogo's at a group of other Gogo's to see who knocks over the most. Battle - Stand Gogo's in opposing lines and take turns to flick extra Gogo's at each other's line in an effort to knock it over. The Bomb - Draw a circle and put Gogo's inside. Stand back and take it in turns to knock each other's Gogo's out of the circle by throwing more Gogo's. Airbone - Throw a Gogo up in the air and try to pick up as many other Gogo's as possible before catching the first one. Basket - Try to bounce Gogo's into a box. The full rules aren't hugely clear but, for added bickering, players can play for keeps. 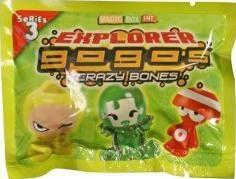 Maybe Gogo's are really a cross between Panini stickers, marbles and the dullest toys to be found in Kinder eggs. Object: To amass an album full of stickers to impress friends, and a bucket full of plastic creatures to spread over the lounge floor in an attempt injure unsuspecting parents who happen to wander in without shoes on. Game length: A few minutes (proceeded by half an hour of comparing collections and followed by several days of squabbling over whose Gogo's are really whose). Number of players: 2 or more. Comments: My right index-finger has started feeling sore underneath the nail just from thinking about Gogo's. I played the Battle variant of the game with Sprog1 a couple of weeks ago and, quite frankly, it was painful. Flicking oddly-shaped lumps of plastic with enough force to result in any hope of them travelling in a straight line quickly became a form of torture. I had to keep swapping fingers. Finally losing was merciful release. Apart from that, Gogo's aren't so bad but I can't entirely see the point of them. It's like playing Marbles with plastic cubes. Sure, they bounce a bit and don't roll away, but they're fundamentally not suited to the task in hand. Even the 'Traditional' variant is unsatisfactory because some of the Gogo's are so oddly-shaped, it's hard to tell which way up they are. Nonetheless, all three of my children are now deeply proud of their bucket of Gogo's and regularly sort and inspect them. Go figure. My main consolation is that the packets aren't £2 each. Relatively cheap to get started. Encourages kids to make up their own games. Enhances bartering and negotiation skills. A black hole for pocket money. Can be easily lost or stolen in the playground. Should come with fingernail protectors. Oui you im a kid i LOVE gogos ignore them n stop moanin about them cos u dont have to play with them!In fact no kid would want to play with them outside unless their in Africa where they have no choice!I think only stupid blind adults would not bother to look where their going and stand on or even chip a kids gogo ! Gogos NEVER get stolen or EVER quarelled about im 10 i still adore the gogos CUTE BEAUTIFUL SMILEY faces and yet you have no humour or appreciation for all this companys hard work! :b everyone in my school loves gogos. I SUGGEST YOU DELETE THIS WHOLE STUPID SITE AND GET A LIFE LOSER!!! this is a stoopid website! im never visiting this website again because of abuse of a toy children take to their hearts! Thanks for stopping by and taking the time to share your views, everyone.